When a honeybee scout, out on patrol, finds a new source of nectar, she flies back to the hive to tell the other bees all about it. To communicate the exact location of the nectar source, the scout bee performs the waggle dance. In the waggle dance, the scout bee literally dances across the vertical comb of the hive in a distinct pattern. During the straight line of her dance, called the waggle run, she shakes her tail vigorously to a certain rhythm. At the end of the waggle run, she turns left, circles back to the beginning, and repeats the dance. The next time she turns to the right, circles back, and then repeats this fascinating figure eight pattern. The bees of the hive surround her and watch intently. The number of waggles she makes with her tail indicates the precise distance to the nectar source. This communication of distance through waggling is amazingly accurate, almost to the inch, even when the nectar source is half a mile away. To show direction, the line of the waggle run points exactly toward the nectar source, relative to the sun. Bees use the sun to navigate, which is why you never see bees out on an overcast day. The waggle dance creates a precise angle between the sun, the hive, and the nectar source, for the bees to follow. As the day progresses, and the sun moves through the sky, the bee changes the angle of her waggle dance to accommodate the changing position of the sun. The bees watching the waggle dance, when they are clear on distance and direction, order the dancing bee to stop, for a brief moment, so they can sample the nectar on her mouth to know which flower they are seeking. All the bees involved in this process are females, since the only job for a male bee is to attend to the queen. When the bees leave the hive, they fly in a straight line to the nectar source on a path called the beeline. The bees fly back and forth on this beeline, harvesting nectar and taking it to the hive, until a new waggle dance points them to a new source of nectar. During the winter, in our area, one of the chief nectar sources for honeybees is the miniscule flower heads in coastal Bermuda grass. 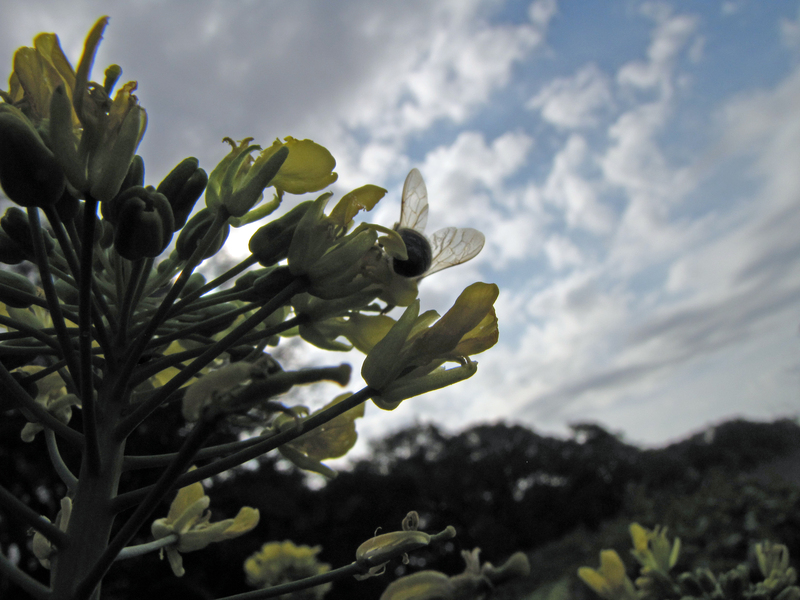 Right now, bees are seeking nectar from the blooms of huisache trees and spring flowers. Soon, bees will look for the flowers of mesquite trees, which is a primary source of nectar for the honeybees of South Texas. To bring honeybees to your garden, plant flowers generously among your vegetables–nasturtiums, marigolds, sunflowers, and blue borage. Bees love the blooms of herbal flowers; plant basil, dill, and cilantro among your vegetables and let them go to flower. Your flowers may inspire a waggle dance on a hive near you, pointed directly at your garden. That’s just amazing! I recently heard that if the bees died, our eco system would break down within seven years. Hello Sylvia! Bees pollinate nearly half of our food crops, and most of our wild plants. If bees were killed off (as is happening with hive collapse syndrome), it would be an unthinkable catastrophe. No one is going to make a horror movie about the after-effects of a bee extinction, but it would be interesting if they did. Corn is self-pollinated, so at least there would be plenty of that to eat, if nothing else. Fortunately, there are a lot of good people out there watching for these kinds of things, to alert us to what is happening, and give us a chance to rectify these problems. Thank you so much Sylvia, I hope you are enjoying this beautiful day! If I weren’t certain you’re telling the truth, I’d consider this impossible. Or, perhaps the beginning of a novel jointly written by Steven King and Thoreau. I’ve heard about hive collapse syndrome, and the need to provide more bee and butterfly crops and all of that, but I missed the waggle dance. It’s fascinating — and useful knowledge! I’ll be passing it along. It is really incredible, isn’t it? It amazes me that bees can actually count–as in counting the number of waggles in the dance and converting that into a precise distance. And also, how is it that the bee knows exactly how much to change the angle of the dance to accommodate for the moving sun? What is it in the bee that remembers the precise location of the nectar source, like a compass that factors in the turning of the earth? When standing in the garden, the flight of bees can seem completely erratic. But there is an amazing design beneath all of it. It is endlessly interesting to me! I hope you are having a wonderful day!